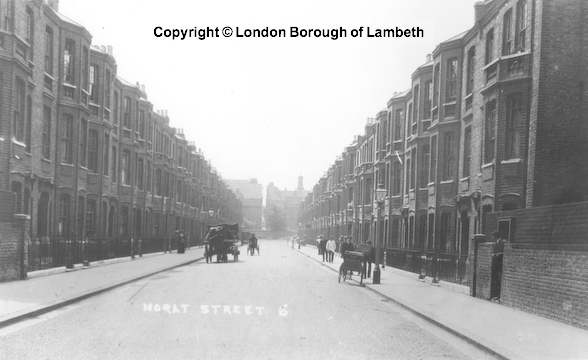 Morat street runs north to south between Liberty Street to the west and Hackford Road to the east. The street is entirely residential and is comprised of terraced houses that in appearance resemble those in Hackford Road and Caldwell Street, each housing three flats. It is unclear as to the exact date that Morat Street was completed however from examining the electoral rolls it is clear that the street was built in sections after 1901, appearing bit by bit on the records until 1907 when it is listed in full. 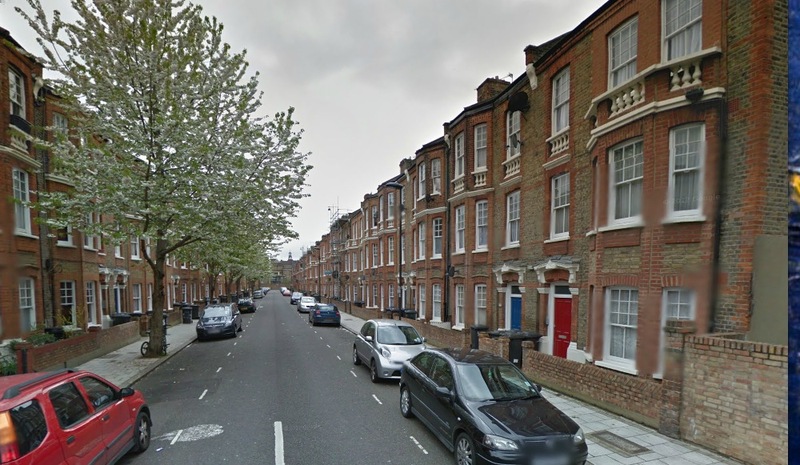 The street was built on what was once open countryside and gardens between Clapham Road and Hackford Road. It is unclear where the name Morat Street comes from or what it is referring to, the only Morat I can find is a place in Switzerland. It is commonly assumed that Morat Street was built as individual houses and converted into flats however this is not the case. This is easy to ascertain by looking at the early electoral rolls and the 1911 Census which describe Morat Street as being flats of either 3 or 4 rooms (excluding bathroom and hall). 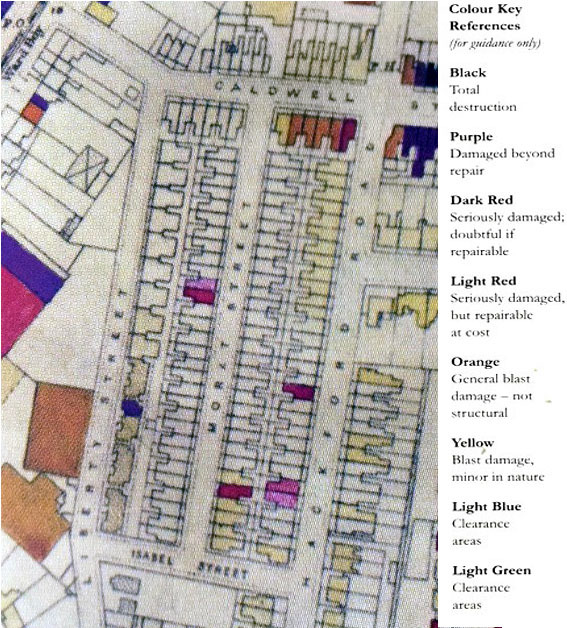 The 1911 Census tells us that Morat Street’s early occupants were a mixture of people of lower middle class and working class backgrounds, young clerks, a taxi driver, a carpenter and many actors, actresses and entertainers. The reason for the presence of those connected with the entertainment industry was to do with the the proximity to Brixton. At the turn of the century Brixton was known as one of the main theatre and music hall areas of London and the entertainers needed somewhere to live, this is where Morat Street, Hackford Road, Cranworth Gardens and Liberty Street came in. 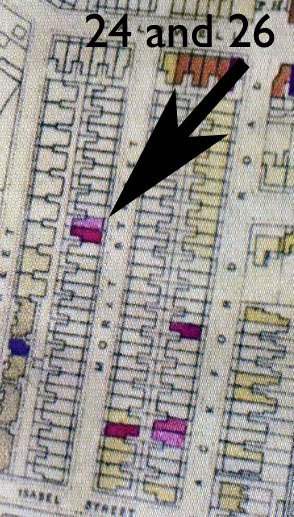 These streets were part of a relatively new phenomenon, flats. Flats were at the time deemed to be a less savoury way of living, suited more to foreigners and unconventional types. They were ideal for the jobbing entertainers of Brixton as they were easy to obtain and most of all, cheap. As the idea of living in flats became more accepted the streets filled up with families living alongside the flatshare setups of French and German waiters and music hall entertainers from as far away as the USA. In comparison to many areas in the early 1900’s Morat Street took on a liberal feel, even becoming somewhat notorious as a place for men to pick up ladies of low virtue. This reputation continued well into the 1940’s when local sources tell me that American GI’s would come to the area looking for a good time. Morat Street stands today much as it has always done, housing a range of people from all over the world, some with families, some in flatshares, far fewer are actors or acrobats sadly. The seedy reputation has been replaced with the quiet humdrum of urban/suburban life. 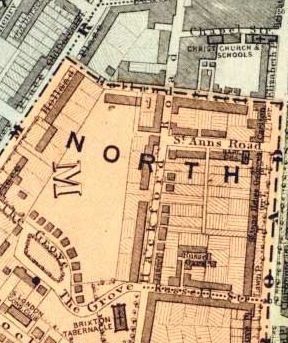 The 1876 Ward map above shows that the area that Morat Street now stands on was once open countryside. 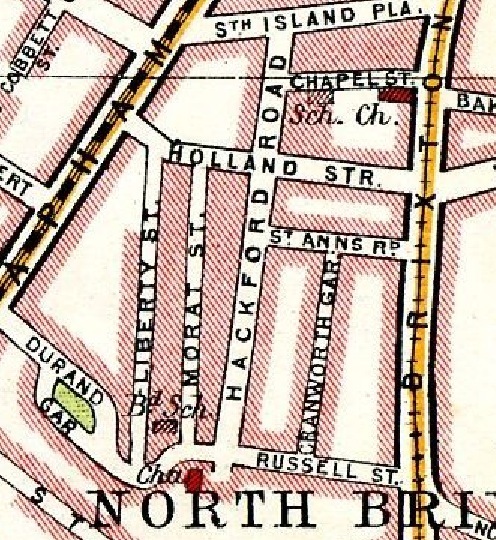 The 1908 map above entitled Bartholomew’s Handy Reference Atlas Of London shows Morat street which in 1908 had only just been completed a year or so. In the photograph above you can see Morat Street in 1910, note the horse and carts. The metal railings were removed in the WW2 metal salvage drive. In September 1940 the government started to collect and collate information relating to damage sustained during bombing raids, the map above is from 1945 and shows all WW2 bomb damage to Morat Street. The street emerged relatively unscathed in comparison to surrounding areas however it did take a couple of hits and some blast damage as you can see above. 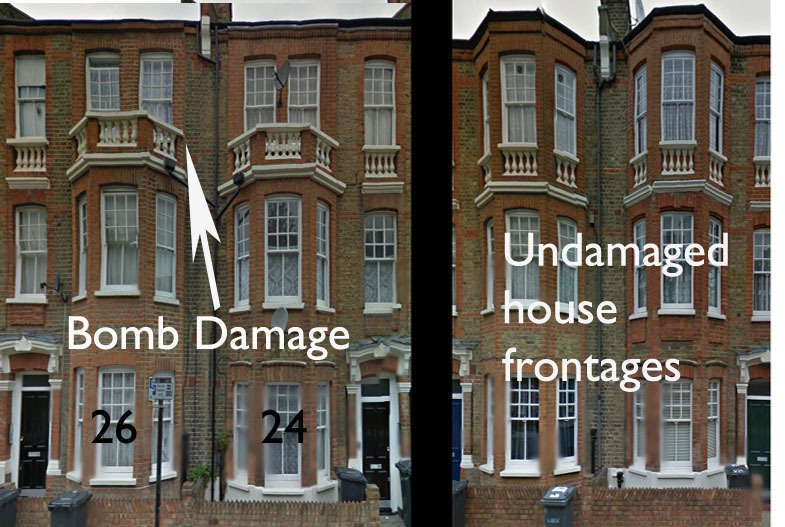 You can see on the image above that number 24 and 26 are missing the top bay windows that the rest of the street has, instead the window areas are flat, you can see where the newer bricks have been put in to patch up the damage. 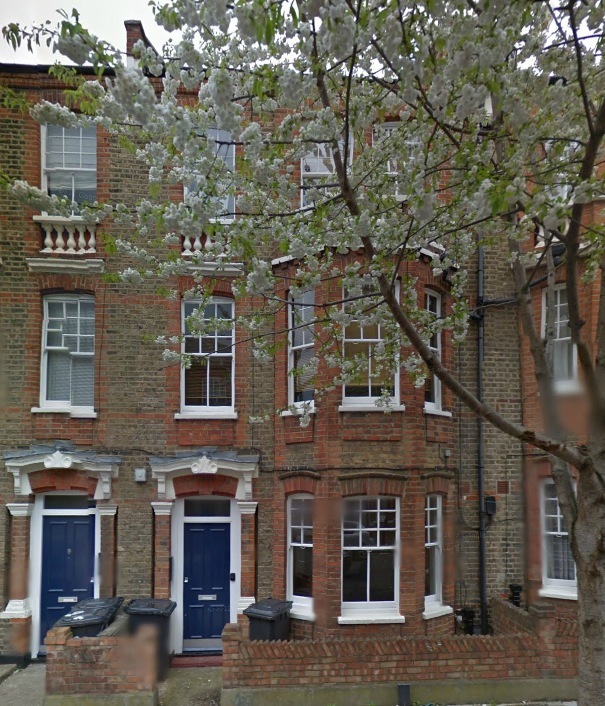 It is the same further down the street at number 47 and 49. I lived in Morat Street from 1961 (straight from Lambeth Hospitial where I was born) until about 1974 when we moved to the Angell Town Estate. My main memory is of Elsie Bright who had a little Aladin’s Cave of broken toys and games in her front room. I also remember Danny and Roger who lived just down the road. Danny I think was a drag artist and Roger was his dresser. Great to see history of Morat Street. My grandmother and mother lived here during the war I believe. My mum was born in 1939. Her name was Valerie Durrant. My grandmother was Kathleen Durrant. Not sure which house it was.